Femme de Joie only dined twice at Doc Clearie's Skyroom, once on the occasion of her high school graduation and again a few years later for a reason she can't recall now. She remembers nothing whatsoever about the meal itself; her memory of the restaurant does not match the above postcard of the interior of Doc's, which says something or other about the illusions time creates. A few years later Doc's became a bar/nightclub where the phrase "meat market" might fit; there is a modern office complex on that site now. Sic transit gloria mundi. In 2011 Doc's granddaughter, Robbie, opened Clearie's, her homage to the late Skyroom in its halcyon days, on the site where The Shack had stood (another long-gone restaurant). Her aim was to create a fine-dining restaurant with a nod to Redding's past and another nod to modern culinary trends. About fine dining: There's no definitive set of standards, no benchmarks a restaurant must meet in order to be thought of as fine dining. Taste in food, decor and atmosphere is subjective; one person's elegant and refined is another person's snobby and overpriced. But for our purposes today, we're going to say that fine dining encompasses luxury - that is, non-essentials - and refinement. 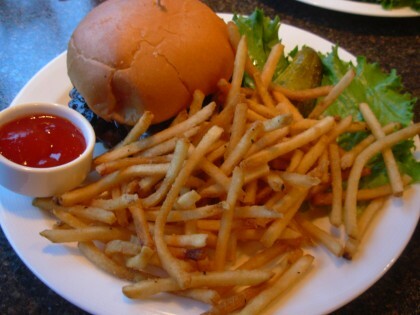 We'll also state that fine dining and franchises do not go together; further, fine dining is not cheap. But back to Clearie's. Enter through an unobtrusive doorway into the small but well-appointed lounge, where you can linger over a drink and order from the bar menu. 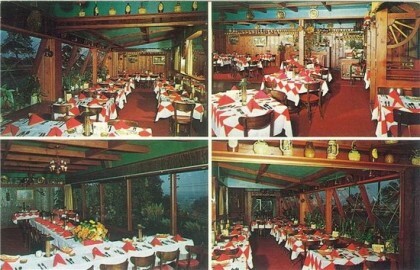 Beyond bar is the L-shaped dining room, defined with booths along the windowed wall and tables across the aisle. 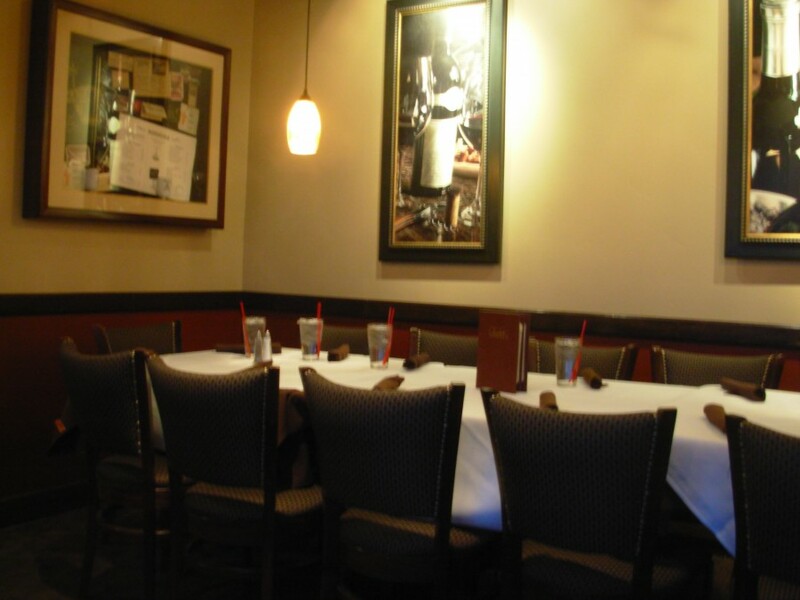 Appointed in rich browns with subtle lighting, the feel is more like a gentleman's club than a dining room perched on a very unglamorous street corner. Service is professional and attentive without being overbearing or intrusive; waitstaff are informed and familiar with the menu. Music piped in evokes the Doc's era: Femme de Joie heard Steve Tyrell's version of "This Guy's in Love With You" twice in 20 minutes, as well as Bobby Darin and Ella Fitzgerald. A nice touch. Clearie's has a full bar; the drinks menu features martinis and Manhattans at $9.50 each, as well as "Smokin' Martinis" (i.e. Strawberry Cosmopolitans, Lemon Meringue Martinis) at $8.50. The wine list is extensive and well thought out, with exceptional wines such as Caymus Cabernet Sauvignon ($110) and Rombauer Zinfandel ($52), as well as a good selection of wines available in 6- or 9-ounce pours. It's a pity the menu doesn't list the vintages. 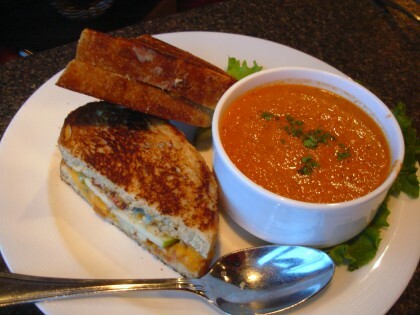 On a lunchtime visit, dining companion Little Sparrow ordered Grilled Cheese with Tomato Soup. What's special about grilled cheese? If you're going to pay $10 for it, it better be good, and this one was. Blue cheese and Cheddar were melted together with bacon and apple slices on sourdough. 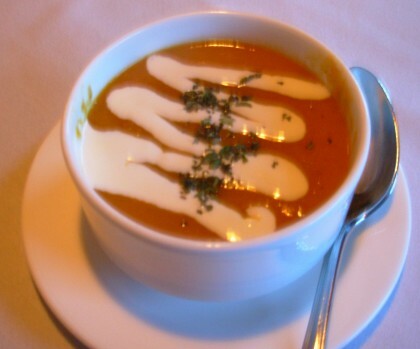 The house soup is smoked tomato - a rich puree that is sweet like a butternut squash soup with a fire-roasted flavor. The Guinness Burger was a delight, a reduction of Guinness to a syrupy sauce was a fine foil for earthy blue cheese and sauteed mushrooms on brioche.The brioche in particular showed attention to detail - rather than create this melange of piquant tastes and then serve it on a spongy tasteless hamburger bun, the kitchen went the extra mile to get really good rolls to match. 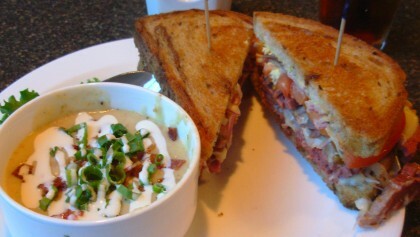 Stopping in one afternoon for lunch, Femme de Joie ordered the special sandwich of the day, corned beef, along with the Loaded Potato Soup . Not deli-sliced corned beef but thick chunks from a corned beef brisket, this was luscious and juicy. Loaded potato soup was rich and creamy, though once the toppings were gone the soup seemed a bit bland. Amico del Signore and M. de Joie visited Clearie's one night to sample their dinner menu. Clearie's offers a "Fresh fifteen at five" - three mains offered at $15 if ordered before 6 p.m. - as well as "Double Date Night" - special for four people for $100 ($60 for two people). We chose to order from the regular dinner menu. Some hot crisp olive bread and garlic butter, addictive as crack, was served with dinner. 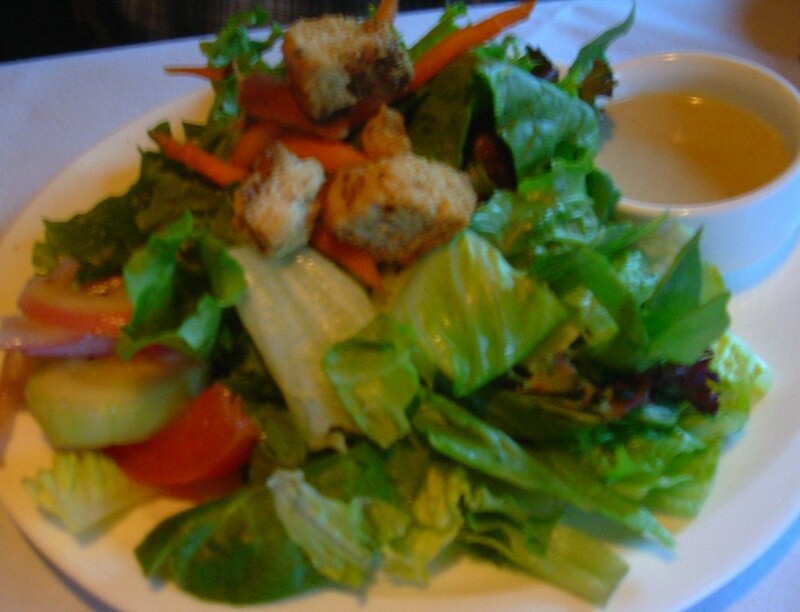 Green salad was crisp and freshly mixed (not out of a bag). House-made blue cheese Caesar dressing was an unusual but pleasing blend of lemony Caesar with pungent blue cheese. Special soup was a spicy carrot puree- which was quite spicy, flavored with cumin and cooled with a drizzle of cream. The carrot flavor was lively and sweetly roasted. Amico del Signore ordered the Filet Mignon Meat Loaf, made from scraps after the entire filet is trimmed. 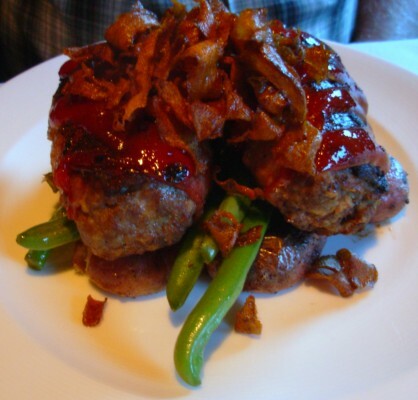 Two thick slices wrapped in bacon and lightly blanketed with a spicy tomato sauce, the meat loaf was served atop perfectly cooked green beans and smashed red potatoes. While the meat loaf was good, it didn't really live up to the luxurious expectations that the words filet mignon imply. It was not substantially different than meat loaf that you might make at home. Scattered across the dish were tiny shards of crisp-fried onions, sweet and delicate; they would have been delicious on their own with a beer. Femme de Joie has long adored sweetbreads and mourned their disappearance from restaurant menus. (Sweetbreads are not what you think they are. They are the thymus gland, an organ in the throat and chest cavity that helps fight disease; it disappears when the calf is about six months old.) She was happy to see them on Clearie's menu, but while the sweetbreads themselves were perfectly cooked tender pillows, they were hopelessly overcome by the dark red garlicky sauce. Their delicate richness was lost amidst all the competing flavors and textures. 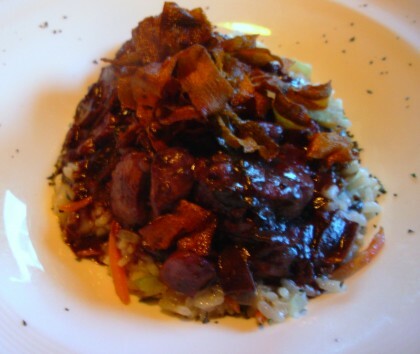 They were served with vegetable risotto, again cooked beautifully but lost underneath too much of the same sauce. It seemed a waste to make a lovely al dente risotto - or for that matter, rich little sweetbreads - and then obfuscate it all with a sauce better suited to be served on red meat. The same onion pieces as served on the meat loaf appeared on the sweetbreads. While many people will sneer, calling it a white-tablecloth kind of place that's too expensive, too snobby, etc., Clearie's does not attempt to be all things to all people. There are many, many casual dining places in the North Valley but very few restaurants offering this kind of elegant, old-school refuge from some of the noisy herd-'em-in-herd-'em-out chain restaurants that multiply like rabbits in Redding. Clearie's knows their target clientele and what they expect when they come for dinner, and that is the secret to their success. It isn't a place Femme de Joie is going to revisit for dinner every month unless someone generous is footing the bill, but lunch is quite a reasonable way to enjoy high-quality, well-prepared food in a pleasantly quiet and refined atmosphere. The level of cooking is very high, though a couple of the dishes need rethinking as far as saucing and seasoning. Further, if she were to drop $50 or more on a bottle of wine, M. de Joie expects to know the vintage. Overall, though, Clearie's fills a need in the Redding restaurant lineup that hasn't been met in many years, and she wishes them a long run.